The weekend just sped by as always. Have a few finds to share with you. Hit just a few garage sales, and they were busts. Wait I did buy one vintage scrabble game for $.25. 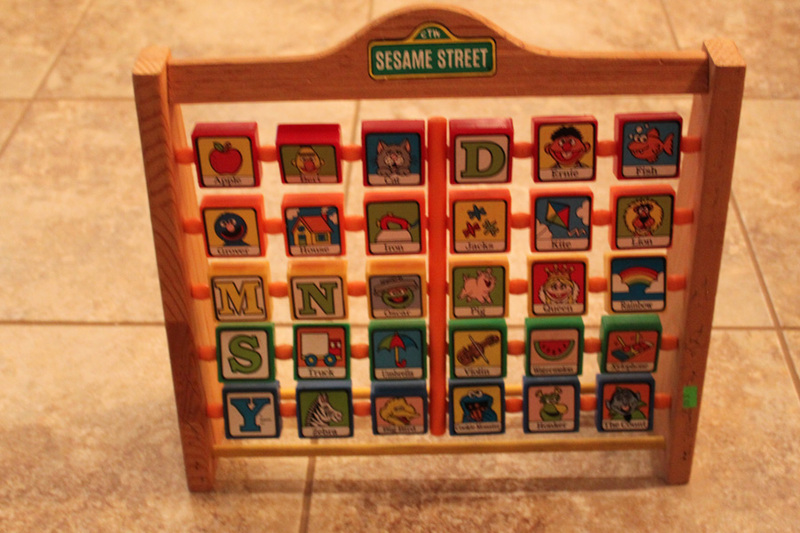 Hit one thrift store and found this Sesame Street ABC toy. I love that the pictures are all in excellent shape. Spent a beautiful day with my Mom at an auction sale on Saturday. Sitting in the shade, bidding on fun items and getting them for $1, $2.50 or $5 for an item or a box. My kind of entertainment. This was especially relaxing since I spent Friday painting the outside of my MIL house. If you have read any of my blog, you know by now that I have a weakness for wooden tool caddies of all kinds. 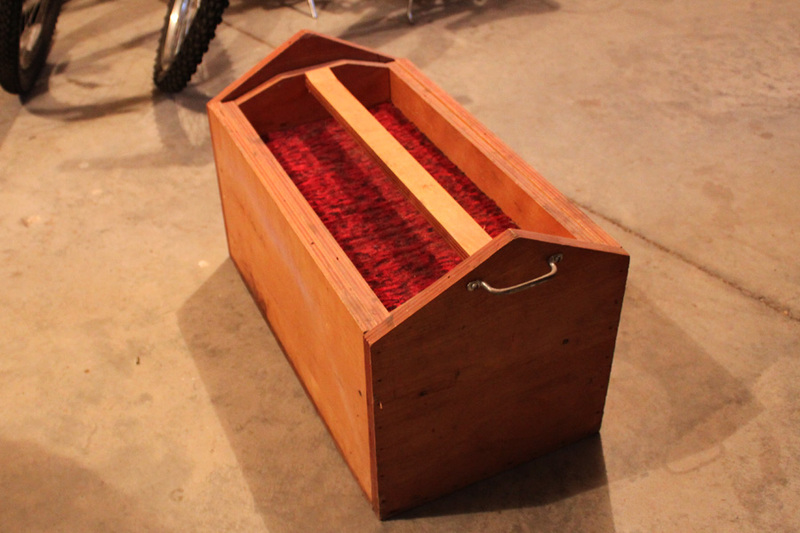 This one is a hand craft tool caddy. A little bigger than I like, but I couldn’t resist it. The red carpet has to go, but it will be fun to keep my tools in. Thought this cobble form is great. 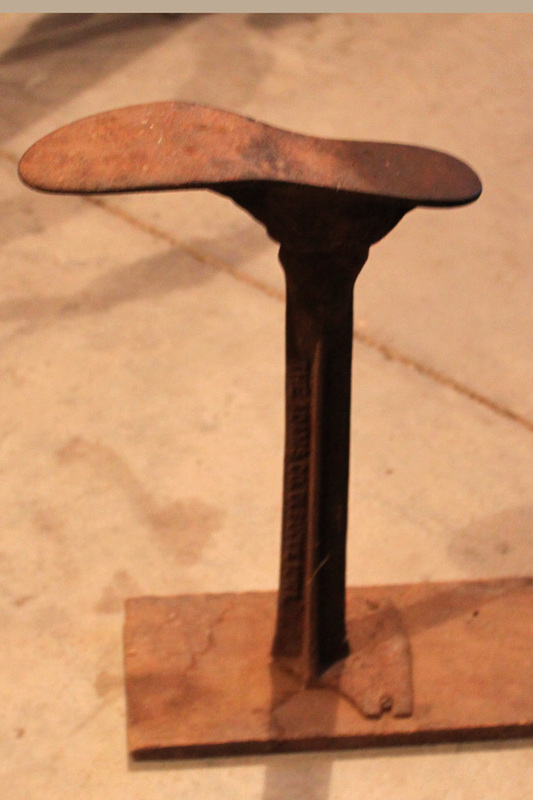 Also got a wood box of 5 shoe forms, but didn’t get a good photo of it. 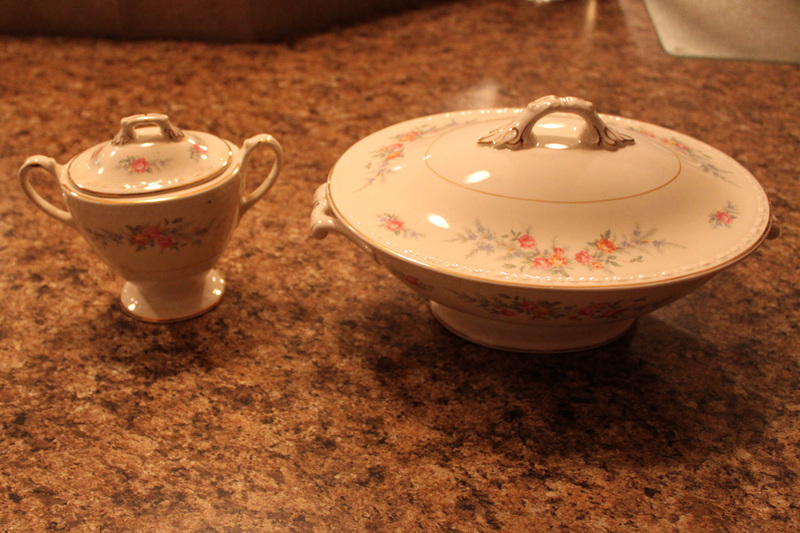 This is a beautiful porcelain sugar bowl and a soup tureen. They are Homer Laughlin Gregorian Eggshell. I can’t find the pattern name yet. Really neat pieces. 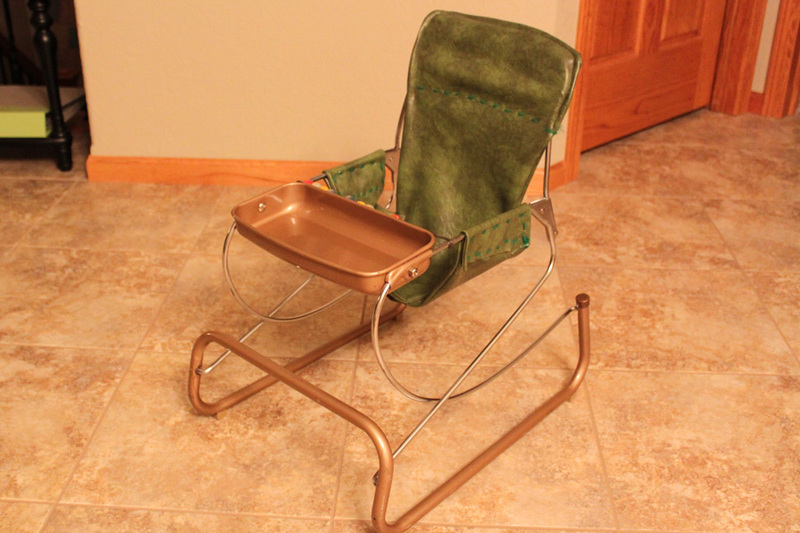 This is a vintage Toddler Bouncing Chair. I am thinking from the 1960’s. Look at the leather seat backing stitched with green yarn. Very simple compared to the baby bouncers of today with their 20 toys attached to it. This one has beads on it, and that is it. No wonder kids need constant entertainment now-a-days; it starts at an early age with their baby bouncers. Ha. 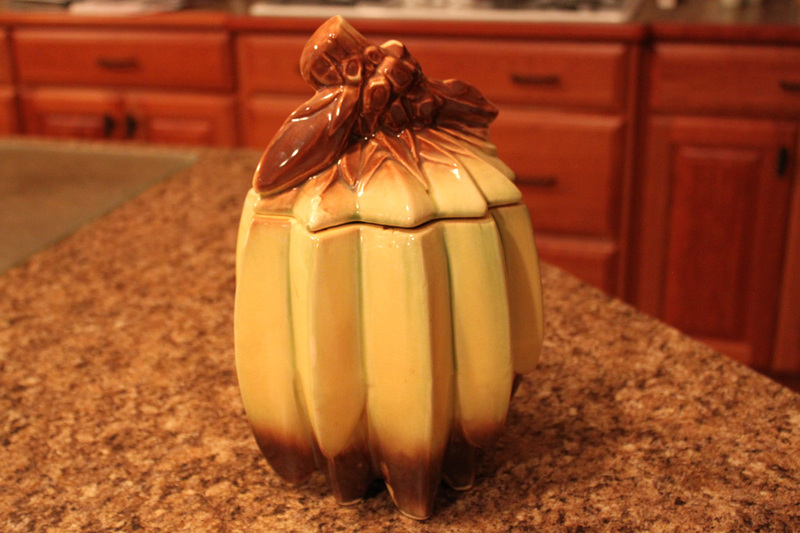 This is probably my best and most surprising purchase; a McCoy Banana Cookie Jar. I knew it was a good piece, but found that in August, one sold for $76 and one sold for $122 on ebay.com. I think that this one is going on ebay. Did you have any luck on your junking outing this weekend? I have a weakness for those tool caddies too. That is a good one you found! A another person after my own heart. I don’t want to count how many I have. Thanks for your comment. I recently found your blog and love it. Hope all of your treasures are sold at your up coming sale. Thanks for your nice words. I am having fun with this blog and my junking/thrifting/hunting. I appreciate your reading my blog. I am a little nervous that it won’t go over well where I live, but it doesn’t hurt to try. Thanks for commenting and again, thanks for hosting the link party. Great finds! Everything looks really nice. I also like the porcelains and the vintage baby bouncer. Thanks. Saw some great bouncers on your site.